The 2019 Grand National Weights were released on Tuesday 12th February – but what does this actually mean? At this stage there are 112 horses entered to run in the 2019 Grand National – seven more than this time last year – and with the race being a handicap, then each horse has to be given a set weight to carry. A handicap race means that horses of varied ability will be given different weights to carry in a bid to make the race as fair as possible – in short, the best horses in the race carry more Grand National Weights. A bit like if we were to run against Usain Bolt. The Jamaican sprinter might have to run with a 10 stone weight on his back to even things out………but, he’d probably still win! So, the better horses in the Grand National will, therefore, carry the most weight. The official handicapper has an industry rating for every horse, and this is adjusted each time it runs a race. By working off these official handicap ratings, this is how the Grand National weights for each horse is worked out. As mentioned, there are currently 112 horses entered in the 2019 Grand National. But this number will come down to a maximum of 40 runners come race day (Saturday 6th April) and, in theory, based on their handicap ratings and the weight each horse has been assigned to carry, then all 40 runners that make the final Grand National line-up should cross the line together. However, as we know this is horse racing, and a lot can happen in a race, so it will NEVER pan-out like that. For example, the highest-rated horse in the 2019 Grand National entries is the Nigel Twiston-Davies-trained Bristol De Mai, who has an official mark of 173. The British Horseracing Authority allotted top-weight of 11st 10lbs and then all the other weights are worked back off this horse. 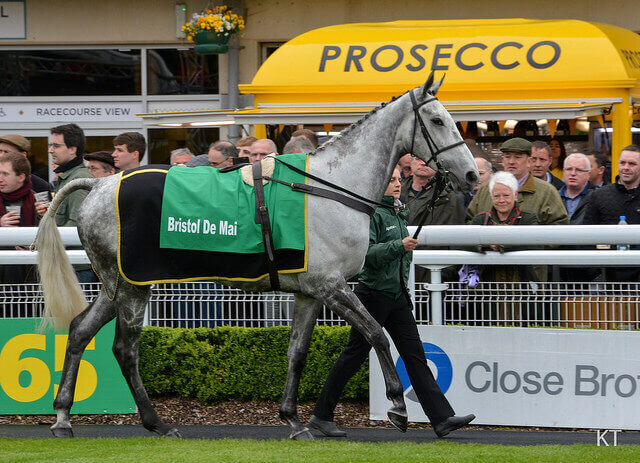 The popular grey – Bristol De Mai – has allotted topweight of 11st 10lbs for the 2019 Grand National so if successful will be the first horse to win with more than 11st 9lbs since Red Rum in 1974. Last year’s Grand National winner – Tiger Roll – is rated 9lbs higher than last year and will race with 11st 1lb, which is only 2lbs more than when he won in 2018, while last year’s runner-up Pleasant Company has 10st 11lbs, which is the same as last year, but is now rated 7lbs higher. 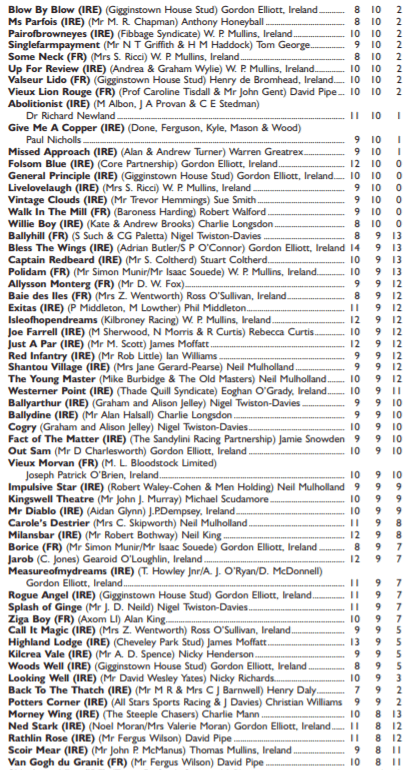 Behind Bristol De Mai, the next top-rated is last year’s fourth – Anibale Fly with 11st 6lbs to carry, followed by Alpha Des Obeaux and this season’s Welsh Grand National winner, Elegant Escape, with 11st 4lbs to carry – that’s a rating of 162. We take a look at some of the main players in the 2019 Grand National. Once the weights were revealed, how did their prices change? (Grand National Weights are in brackets). Last year’s winner will be looking to become the first back-to-back winner since Red Rum in the 1970’s but despite being rated 9lbs higher this year will only have 2lbs more in weight to carry. He’s still one of the main Grand National favourites in the betting at around 20/1* and as soon as the ‘once-a-year-punters’ remember his name then that price could easily get a lot shorter. Winner of the Welsh Grand National this season at Chepstow so staying won’t be an issue. He’ll be looking to give his Cheltenham Gold Cup winning trainer – Colin Tizzard his first success in this race and many bookmakers reacted to his weight of 11st 4lbs by shorten his Grand National odds coming in from 25/1* to 20/1* and is even as low as 14/1* with some firms. Has come in for a bit of support in the 2019 Grand National betting market after the weights were released and it’s easy to see why. Owned by Trevor Hemmings, who loves to win this race (3 wins) and trained by Sue Smith, who tasted success in the Grand National in 2013. His price has come in from around 40/1* to 20/1* with the news that he’ll have just 10st to carry. Ran fourth in the race 12 months ago with 11st 8lbs but has 2lbs less this time. Is also another year older (9 years-old) and with that track and fence experience under his belt looks to have a solid chance again. He’s around 33/1* in the betting. Is up 7lbs in the official ratings from last year when running a very close second, but with 10st 11lbs does get in with the same racing weight. Being proven over the fences is a big plus and comes from the leading Irish yard of Willie Mullins, who won this race back in 2005 with Hedgehunter. Last year’s runner-up is generally on offer between 25/1* and 33/1* in the Grand National betting market. Allotted top-weight of 11-10 so will be looking to become the first horse since Red Rum (1974) to win with more than 11-09 on his back. Does, however, hail from the powerful Nigel Twiston-Davies yard that has won this race twice before (1998, Earth Summit) and 2002, Bindaree). He’s around 33/1* in the 2019 Grand National betting market. Twiston-Davies added though that the Gold Cup is the main target and we’ll see after that. Will the 2019 Grand National Handicap Weights Change? There will be horses that don’t make the final 40 and if the top-weight – Bristol De Mai – is one of those then we’d have a new top-weighted horse for the rest to work off. However, each horse’s official handicap mark CAN’T be changed now. So, for example, if Bristol De Mai comes out and wins the Cheltenham Gold Cup in March (before the Grand National) by 20 lengths then in future the handicap would certainly raise his current rating of 173. But with the weights and official Grand National handicap weights already set in stone from Feb 12th his rating would NOT increase. Of, course this can work both ways. If that horse (or any other) had a stinker of a race between now and the Grand National in April his mark (or weight carried) wouldn’t be dropped. Simply put, the Grand National Handicap weights are now set in stone. This is to help punters, the bookmakers, trainers and the race organizers. It means everyone knows where they stand and also gives a full 2 months preparation before the big day. Some recent winners have carried 11st (or more) to victory. But looking back at recent trends make this weight your cut-off point. If you look back over the winners, we’ve only seen the mighty Red Rum (1974 & 1977) and Many Clouds (2015) carry 11-8 or more. The 2018 Grand National winner – Tiger Roll – carried 10st 13lbs to victory, while the 2017 hero – One For Arthur – had 10st 11lbs on his back. 22 of the last 28 winners carried 10-13 or less, while a massive 31 of the last 34 winners carried 11-1 or less. What Happens to the Grand National 2019 Entries? 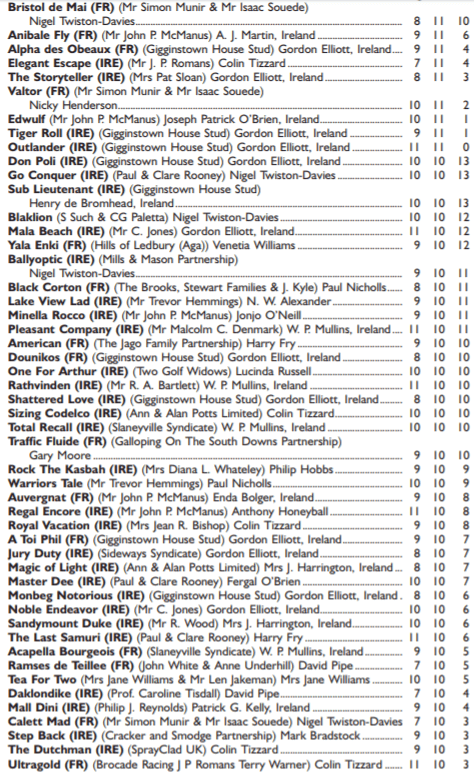 Of the 112 horses entered into the 2019 Grand National, only 40 will run. The first scratchings deadline is at the end of February, second scratchings deadline in the third week of March, five-day confirmations April 1st, final declarations 10am April 4th. Maximum field of 40, plus four reserves.